C12 DD Compact Cordless Drill Driver. M18 CPD Compact Percussion Drill. 1 x 1.5Ah REDLITHIUM-ION™ battery. 1 x 3.0Ah REDLITHIUM-ION™ battery. 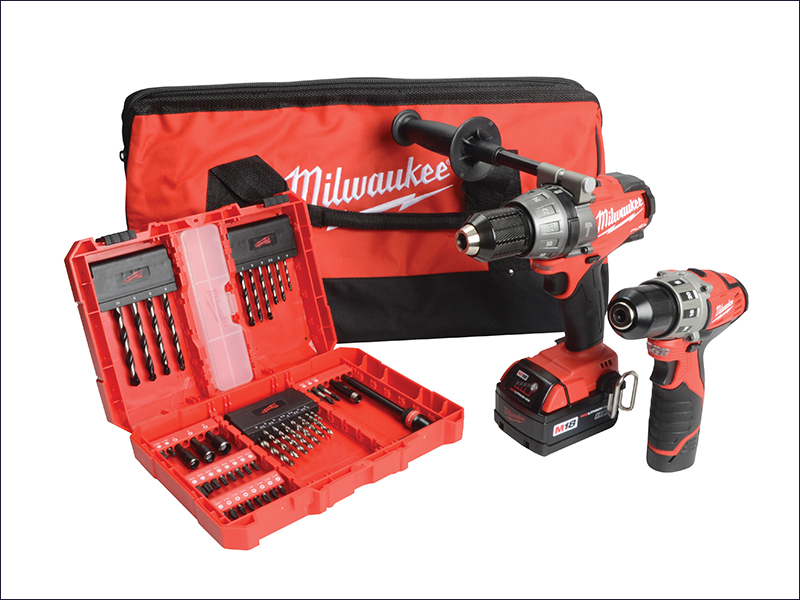 12 Volt compact drill driver with single sleeve chuck for quick accessory change. With REDLINK™ overload electronics in both the tool and battery pack for excellent system durability. Compact and lightweight with slimline soft-grip handle. Max torque: 32Nm 21 Settings. Capacity: Wood: 22mm, Steel: 10mm. 18 Volt 2-Speed Compact Combi Hammer Drill with POWERSTATE™ brushless motor, REDLINK PLUS™ intelligence and REDLITHIUM-ION batteries. Featuring 3 modes for versatile use, a bright LED light for workspace illumination and a side handle. Capacity: Wood: 45mm, Steel: 13mm, Masonry: 15mm.